SFWA has designated Unidentified Funny Objects, edited and published by Alex Shvartsman, as a Qualifying Professional Market, the first anthology series ever to appear on the list. A SFWA Qualifying Professional Market has been determined by the SFWA Membership Committee to meet the SFWA bylaws and other membership criteria. 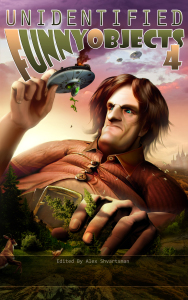 Unidentified Funny Objects is an annual anthology of humorous SF currently in its fourth year. Past contributors to the anthologies have included George R.R. Martin, Neil Gaiman, and Esther Friesner. This entry was posted in Like Show Business and tagged Alex Shvartsman, Cat Rambo, SFWA by Mike Glyer. Bookmark the permalink. I’ve read all three UFO volumes to date, and am looking forward to the fourth. Good stuff.